It is an Indian traditional delicious sweetened Milk & cottage cheese(Paneer) base dessert.It's a variation of Barfi.it is very popular in North & East India. * Boil 1/2 milk in a pan & add citric solution into the boiling milk. * Once Chenna settles,sieve through muslin cloth,wash it under the running water (to remove citrus taste from chenna)then press out & remove excess water. * Boil remaining milk in pan ,add chenna & sugar. 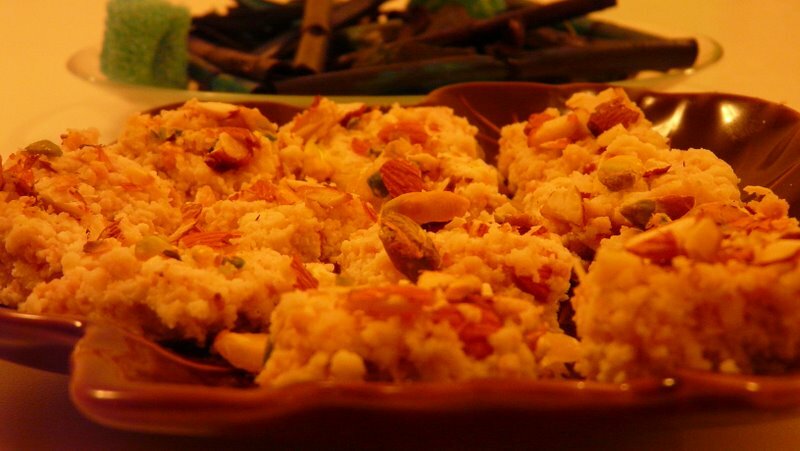 * stir it continuously until chenna & milk turns into thick crumbed mixture & start binding together. * Spread it on a grease plate,allow it to cool & sprinkle chopped nuts. * Preferably use Nonstick or any heavy bottom pan to reduce the chances of burning. * Ricotta cheese or ready made paneer can also be used instead of making homemade chenna. * Lime juice/Vinegar can also be use to make chenna instead of citric acid powder. * Don't knead the cheena.